Last week, Southeastern Auto Auction of Savannah hosted its annual Masters Sale and golf tournament, which is named after The Masters golf tournament that is held in Augusta, Ga., just a few hours away from the auction. This year’s Masters Sale featured over 800 vehicles, and by the end of the sales event, the auction gave away over $2,500 in cash prizes, according to SAA. To wrap up the sale, dealers were selected to putt on the auction’s putting green for a chance to win up to $1,000. The day following the sale, the auction’s golf tournament featured a record number of teams as well as a $25,000 hole-in-one challenge and longest drive contest. Additionally, from hole sponsorship funds for the event, the auction raised a donation of $3,000 to present Shriners Hospital for Children following the tournament. “It was a great week! We sold a lot of cars, had beautiful weather for the sale and golf tournament, and raised money for Children in need,” SAA vice president Bill McCready said in a news release. Carriage Trade Public Auto Auction will host its 40th-anniversary sale on May 22, which will feature an estimated 1,000 vehicles along with a number of prizes and giveaways, the auction recently announced. “We’re excited about this milestone anniversary and are looking forward to celebrating with the people that have made it possible, our customers and our employees,” Carriage Trade general manager Brian McNally said in a news release. In May of 1977, Carriage Trade held its first sale with a total of just 35 vehicles, the auction said. Currently, the auction sells on average about 500 cars each week, according to Carriage Trade. For more details about the auction's sale, visit www.carriagetrade.com. DAA Northwest recently announced that Rock & Roll Hall of Famers Lynyrd Skynyrd will take the DAA stage on July 19 for the auction's 22nd annual Rock & Roll Sale. “Each year, we put a lot of thought into bringing in a headliner that will be a great fit with our customers. Judging from the smiles on faces in our lanes last Thursday, Lynyrd Skynyrd fits the bill,” Bob McConkey, president of the McConkey Auction Group, said in a news release. DAA first announced Lynyrd Skynyrd would headline the annual event during the auction's NASCAR Days sale on April 20. Following the year McConkey invited Jerry Lee Lewis for DAA Northwest’s first Rock & Roll event to commemorate a move to a new facility in July of 1992, “customers immediately began asking McConkey, ‘Who are you going to have next year?’ It was clear the Rock & Roll Sale needed to be an annual event,” the auction said. DAA Northwest has since hosted artists such as Chuck Berry, Heart, The Doobie Brothers, Pat Benatar, Chicago and a number of other international headliners. “We host promotions every month, but the Rock & Roll Sale is definitely our signature event,” McConkey added. The auction said Lynyrd Skynyrd is a cultural icon that appeals to multiple generations, and their hit song “Sweet Home Alabama,” which became a classic American rock anthem, has sold over two million ringtones. The Southern rock band has a catalog of over 60 albums and has sold more than 30 million albums worldwide, according to DAA. Additionally, more than 5,000 cars, trucks and bikes will also be featured during DAA’s annual sale and the event wraps up with over $30,000 in prizes. Manheim Pennsylvania will host over 100 auctioneers who are set to face-off in the 2017 World Automobile Auctioneers Championship (WAAC), which will showcase auctioneers competing for $12,500 in prize money as well as the title of the best auctioneer, best ringperson and best two-person team. Auctioneers will be judged on chant, voice quality, salesmanship and other performance elements of efficient and authentic auctioneering. Contenders will also have to showcase their ability to interact and communicate with bidders and buyers. “The level of talent at this event will be unparalleled, and picking the winners will be an exciting, tough job,” Manheim Inventory Services senior vice president Grace Huang and judge for the championship said. Other Auto auction industry executives set to attend the championship include Shane O’Dell, president of Cox Automotive Financial Solutions Group and Jerry Hinton, president of the National Auto Auction Association. Manheim Pennsylvania is said to be the largest auction in the world, its operations currently sit on 400 acres, according to Manheim. Columbus Fair Auto Auction announced that it has been tapped for the second year in a row by Ally Financial to receive its Leadership Auction of the Year award in recognition of its overall sales performance last year. CFAA was founded by Jacobs’s father, William Jacobs, in 1959. The auction currently has 11 auction lanes, a reconditioning center, a 48-bay body shop, a mechanical repair center, an on-site test track, and a full-service restaurant, according to the CFAA website. In other auction news, the National Auto Auction Association announced on Monday that its auction standards committee has updated its arbitration policy and guidelines. The committee made several changes, and their edits include the exclusion of previous policy material as well as the addition of new material. To view each of the committee’s changes, click here. The parts of the policy the committee has newly omitted is written in red and all new policy content is in green. NAAA’s final version of its updated policy and guidelines can be accessed via the "Policy" section on www.naaa.com. CarMax will open two new stores in the state of Washington — the used-car retailer’s first locations in the Puget Sound region — the company announced on Friday. One store will be in the city of Lynnwood at 202 Valley Avenue Northwest and the other will be located in in the city of Puyallup at 21317 Highway 99. CarMax said the new locations will provide more than 200 new jobs to the area and will supply customers with around 200 to 400 vehicle options of nearly every make and model. In addition to the vehicles ready to purchase at each location, customers can ask for transfers of just about any vehicle at other locations nationwide, according to the retailer. “Our company is committed to making every step of the car buying process stress-free for our customers, and we look forward to serving the Puget Sound region with the great customer experience CarMax is known for,” Bill Nash, president and chief executive officer of CarMax, said in a news release. At a grand opening celebration on Friday, CarMax said the CarMax Foundation was set to give out $25,000 in grants and donations to local organizations, including Junior Achievement of Washington and Communities in Schools of Puyallup. Associates of Lynnwood and Puyallup locations chose the two organizations and have participated in volunteer events with both groups, according to CarMax. “We are honored to support these organizations and admire their dedication to serving area youth,” David Thompson, location general manager of the CarMax in Lynnwood said. “The community has been very welcoming of CarMax and we look forward to being a great regional partner, while serving customers for years to come." Additionally, CarMax announced it also has plans to invest approximately $95,000 to fund a Puget Sound area playground, which has been projected to be built next year through a partnership with KaBOOM!, a national nonprofit that encourages children to get the balance of play they need to grow into healthy and successful adults. Ally and TIME held a celebration event in Kentucky on Monday to honor the 2017 TIME Dealer of the Year winner — Carl Swope — a second-generation dealer who currently oversees six dealerships representing nine brands in Elizabethtown, Ky., and Radcliff, Ky.
Swope was selected from a group of 49 nominees from across the country who are successful auto dealers that demonstrate a long-standing commitment to community service, Ally said. The event was held at Swope Toyota in Elizabethtown. Business leaders from TIME and Ally joined local government officials and dealership personnel in attendance. Ally said Swope has been chosen for his community involvement, support of civic activities, and dedication to local nonprofit organizations such as Hardin Memorial Health Foundation, Habitat for Humanity and Project United. "On behalf of all of us at Ally, we are honored to recognize Carl Swope and his commitment to doing right and bettering the community and the state of Kentucky," Ally president of auto finance Tim Russi said in a news release. "Carl Swope embodies the character and type of leader that the Time Dealer of the Year program was built to recognize." Swope and his family of dealerships have particularly supported the Community Health Clinic of Hardin and LaRue Counties since its founding in 2002. In honor of Swope being named dealer of the year, Ally donated a $10,000 grant to the clinic. "We are so grateful for Carl Swope's involvement with the Community Health Clinic of Hardin and LaRue Counties," chairman of the board of directors Dr. William Handley said. "We are elated that Carl has been chosen for this prestigious award, and we cannot thank him enough for his contribution to this organization. Day in and day out he continues to inspire and encourage thousands of community members." Swope was first announced as the TIME Dealer of the Year at the National Automobile Dealers Association Convention in New Orleans on Jan. 27. 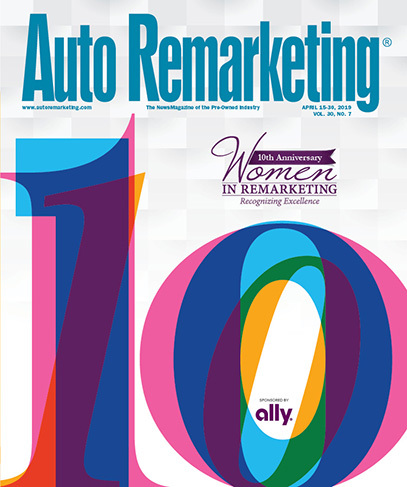 For more information about the award program, or to read about this year’s nominees, visit www.allydealerheroes.com. Southeastern Auto Auction of Savannah announced that it raised more than $4,000 to give Shriners Hospital for Children and hosted its annual “Cars, Cash & Caring Sale” earlier this month. “It was a great day for Shriners Hospital for Children thanks to our generous dealers,” Southeastern Auto Auction vice president Bill McCready said in a news release. The auction raised a portion of the donation at the third annual sale event through 50/50 drawings and over the previous five weeks collected an auction contribution for every transaction made. Regardless of a child’s family’s ability to pay, Southeastern Auto Auction of Savannah said, Shriners Hospital for Children is committed to providing the best care for children in the areas of orthopedics, burn care, spinal cord Injury and cleft lip and palate. Additionally, at the sale event, the auction featured a large run of vehicles as well as record consignment of fleet/lease/bank and rental units, according to the auction. “Our institutional business has grown rapidly over the last two years and it was on display for this sale. It was a great day for both buyers and sellers. Katie Rushing (national remarketing manager for SEAA) offered a record number of vehicles from her accounts,” McCready added. Following the sale, $25,000 in cash and prizes was given away. The giveaways included $10,000 in cash, a 75 inch Samsung television, Bose sound systems, Yeti coolers, custom office furniture, chrome seafood steamers and more, according to the auction. Walker will discuss how providing workers with a safe and healthy workplace is critical to the wellbeing of business during the event that's scheduled for 2 p.m. (ET) on Feb. 21. More specifically, Walker will walk through what OSHA expects from employers such as the regulations and penalties in place for maintaining a safe workplace as well as the business benefits of gaining knowledge about safety and OSHA. The Webinar will be moderated by NAAA chief executive officer Frank Hackett. To join this event, registration is required. Registration can be done here.